SALT LAKE CITY, Utah – HARMAN’s DigiTech today announced the introduction of its Dirty Robot e-pedal for its iStomp programmable pedal. 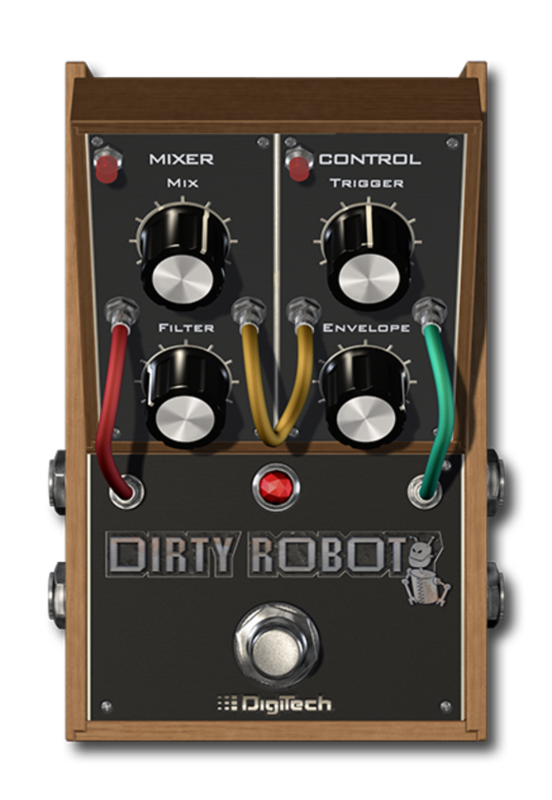 The Dirty Robot transforms the sound of a guitar with sub-harmonic and filter synthesis, providing low-end sub-octave and synth-like filter sweeps. The DigiTech Dirty Robot’s Mix, Filter, Envelope and Trigger controls offer enable total control of the pedal’s guitar synth capabilities. The Mix knob blends dry signal with the synth effect. Filter controls the amount of waveform synthesis that is added to the sub-octave signal. The Envelope knob selects the type of filter sweep with both Rise and Fall options and variable time ranges, to create long filter sweeps, classic auto wah sounds, “reverse wah” and more. Trigger controls the envelope sweep sensitivity, for touch-sensitive control of how the effect triggers – the harder the player picks, the more the filter kicks in. The DigiTech iStomp is a new concept in guitar stompboxes that allows musicians to turn the iStomp into any pedal in the Stomp Shop online pedal store. Offering almost limitless sonic possibilities, the iStomp connects to an Apple iOS device where musicians can use the Stomp Shop app to load it with the e-pedal of their choice. The Stomp Shop is a free app and comes with ten of the most popular requested pedals. It gives access to more than 40 additional pedals that musicians can browse, try out and purchase, with more pedals added every month. The DigiTech Dirty Robot e-pedal will be available in December 2012 at an introductory price of $0.99. This introductory price will run for four week. After the introductory period the price will change to $4.99. The DigiTech iStomp is currently available at $229.95 suggested retail.